Description: This Original Little People set is more like a mini-playset, plus a pull toy in one! The three-piece set includes a small one-seat car, a straight-sided Original Little People boy figure, and a small tow truck. The car is a decandant of the cars used in 1963-1965's #932 Amusement Park, except the car used in this set has larger wheels, and a c-shaped trailor hitch on the back. 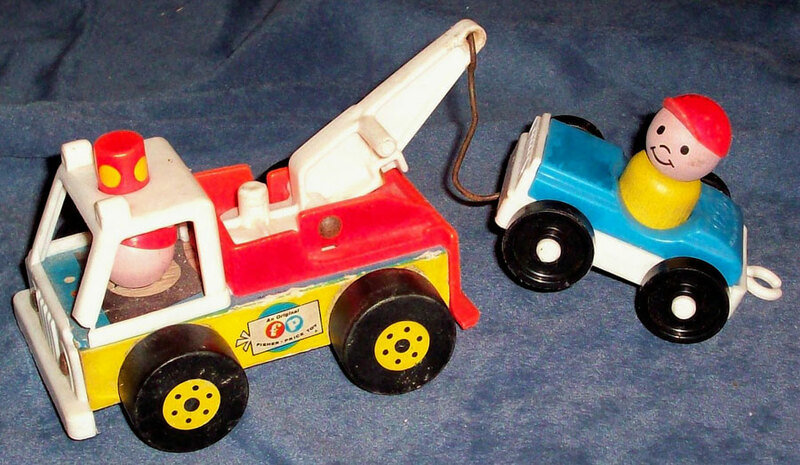 The tow truck has a permanently attached driver that bounces as the truck rolls, plus a red flasher on top of the cab that spins, and a "putt-putt" sound to add to the realism. The truck has a movable plastic boom on the back with a metal hook on the end that hooks to the car. FPT8457 - Blue top, white base garage style car. This car has a C-HOOK on the back and TWO metal rivets on the bottom. The car is marked "fp" and "Fisher-Price Toys" on the TRUNK lid, has NO gas hole, and rolls on black 7/8" dia. wheels that are marked "Fisher-Price Toys". The wheels are held on via white plastic axles. *See "Variations" below. FPT4844 - Metal Hook for end of tow boom. FPT544 - Wooden tow truck with a WHITE plastic front grill, windshield, cab roof, and tow boom. The back of the truck has a red plastic bed with a boom in the center that pivots up or down. There is a metal hook (SEPERATE piece) attached to the end of the boom (to tow/pull a car). 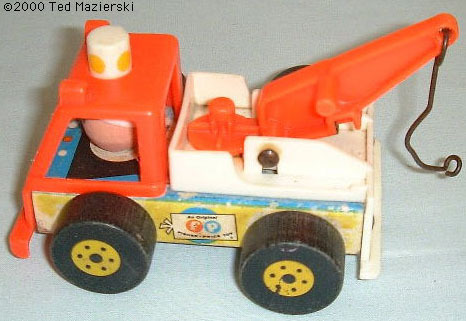 The truck has yellow paper litho decals on the sides with a Fisher-Price logo in the center between the wheels. The truck rolls on 4 black wooden wheels. IWWW - Yellow straight-sided boy with a recessed "belt" on his base about 6mm from the bottom, a smiling face with freckles and "" eyebrows, and wearing a blue front-facing baseball cap. White top, blue base 1-seat car with a C-shaped trailer hitch on the back. The car's wheels are the same size as those used on the #930 Garage vehicles. The wheels are held on with white plastic knobs, and the wheels have "Fisher Price Toys" on them. This car has NO gas hole and it has "F" and "P" in circles on the back trunk lid. FPT543 - Wooden tow truck with a RED plastic front grill, windshield, cab roof, and tow boom. The back of the truck has a red plastic bed with a boom in the center that pivots up or down. There is a metal hook (SEPERATE piece) attached to the end of the boom (to tow/pull a car). The truck has yellow paper litho decals on the sides with a Fisher-Price logo in the center between the wheels. The truck rolls on 4 black wooden wheels. KTWW - Yellow straight-sided boy with a recessed "belt" on his base about 6mm from the bottom, a smiling face with freckles and "" eyebrows, and wearing a white front-facing baseball cap. This set was sold in a 8" long, 3-1/4" wide, 3-1/4" high display box. Retail price in the 1971 J.C. Penneys Spring and Summer Catalogue was $3.33.